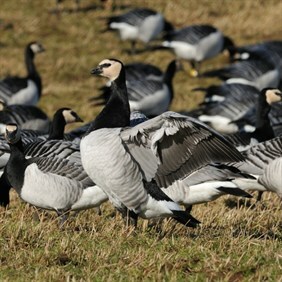 Internationally important numbers of Svalbard barnacle geese overwinter at Mersehead up to 25 per cent of the world population. We have secured the site as a refuge for these birds, and now maintain 50-100 hectares of improved grassland for their benefit. Alongside this, we farm spring arable crops such as oat and re-seeded grassland at Mersehead. This has helped increase the number of wintering barnacle geese and other important farmland birds, including skylark, linnet and reed bunting. Discover the breathtaking scenery and wildlife that's typical of this region. MerSehead RSPB Reserve is set between the beautiful Solway coastline and rolling, heather-clad hills, Mersehead is a wildlife haven, suporting huge numbers of birds, flowering plants and invertebrates. The reserve has excellent facilities for visiting schools, including a new pond-dipping area, visitor centre, hides, abundant wildlife and a variety of habitats to investigate.The RSPB is managing the reserve in order to maintain and enhance its overall biodiversity, and to provide a working example of the benefits of RSPB management. There are 2 nature trails. Wetland (3.2 km) and Coastal (4 km) Trails. Wetland Trail suitable for wheelchairs/pushchairs. Coastal Trail not suitable for wheelchairs/pushchairs. On the reserve are a pair of semi-detached cottages, Barnacle and Shelduck, which are open on the reserve for bookings throughout the year. Group bookings welcome and guided walks available, the visitors centre has refreshments and a shop selling Nature Detective equipment for children, wildlife cards and prints. A great wildlife event for all the family the reserve also has parking, toilets and a picnic area. £3 car-parking charge for non-members.